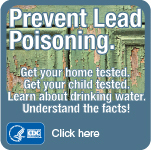 Lead Poisoning Prevention Week is October 21-28, 2018! Click to find out more. October 21-28, 2018 is both National and International Lead Poisoning Prevention Week!